Birth date and place c. 1829 Butts, Kilkenny, Kilkenny, Ireland. Physical Description Height: 5 ft. 6 ins. Complexion: sallow. Eyes: brown. Hair: black. Marriage date and place 1867 Perth, Western Australia. Children Mary Ann Henrietta 1869, Fremantle, Western Australia (tentative). Catherine Helen 1871, Perth, Western Australia. James Thomas 1873, Perth, Western Australia. Patrick John 1878, Perth, Western Australia. 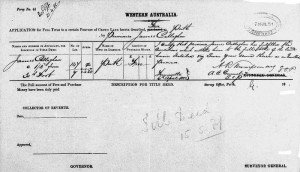 Death date and place 18 Jun 1908 76 John Street, Perth, Western Australia. Burial date and place 19 Jun 1908 Karrakatta Cemetery, Western Australia. Roman Catholic Area, Section AA, Gravesite 0347B. 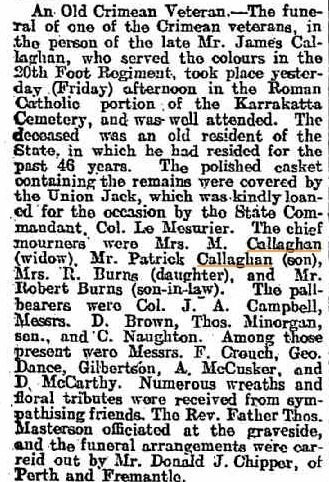 Death Notices and Obituaries West Australian 30 Jun 1908. Regiment(s) 30th (1st Cambridgeshire) Regiment. Regiment No. and Rank #3968 Private. 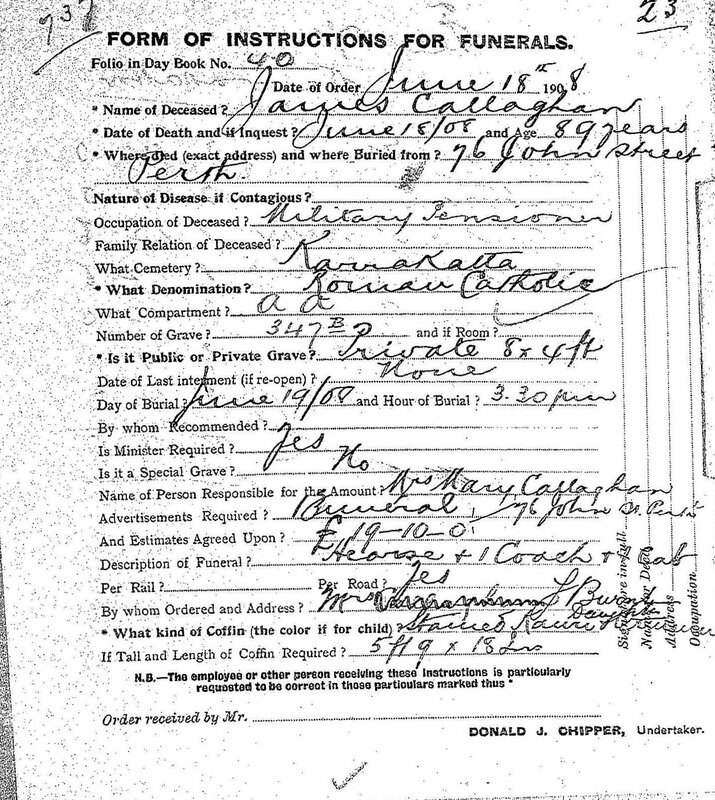 Attestation date and place 18 May 1854. Medals, Clasps and Badges Crimea War Medal with clasp Sebastopol. Turkish Crimea Medal. 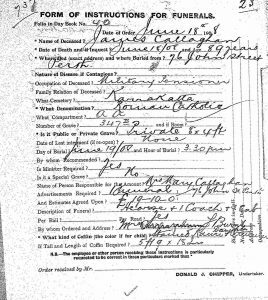 Disabled by weakness in the lower extremities and pain over the sacrum after gunshot wound of both hips received on 8th Sept at 2nd attack at the Redan. The ball entered the right hip immediately behind the greater trochanter and passed through the sacrum at its junction with the os coccygis ?????? near the joint of left hip. States that no pieces of bone came away but that for 6 days after he was wounded he was unable to pass water and that a catheter was required twice daily during that time. Unfit for further service. 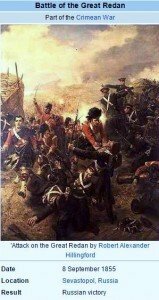 Regimental Courts Martial Tried and imprisoned 24 Aug to 7 Oct 1854. Tried and imprisoned 18 Mar to 30 Apr 1855. Tried and convicted 6 Aug to 9 Aug 1855. Tried and convicted 31 Aug to 4 Sep 1855. Length of Service 1 year 159 days. Post Discharge Residence Kilkenny (1856). 1st Edinburgh & Kilkenny (1858). Western Australia (1863). Pension Amount 1/2d. per diem. Increased to 1/2d. per diem 18 Jan 1881 for service EPF. 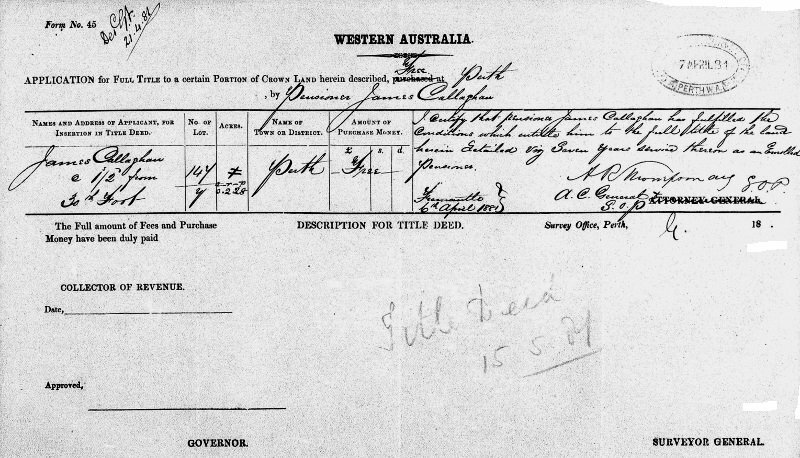 Land Grant/Purchase 15 May 1881, Perth Loc. Y147. Grant. 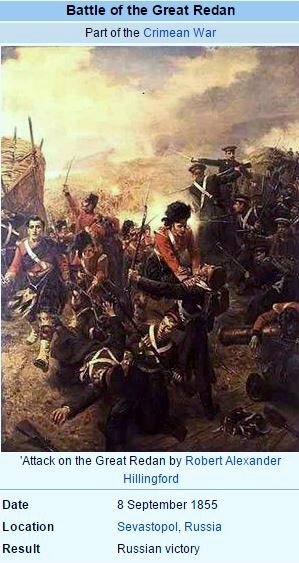 Attack on the Redan at which James Callaghan was severely wounded. Land granted to James Callaghan at Perth Loc. Y147. 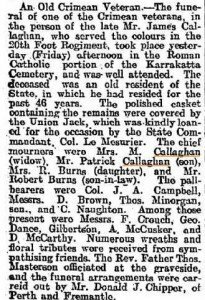 Funeral Notice West Australian 20 Jun 1908.